Many of you are not on Facebook, so I thought that I’d like to share a little bit of the fun we had last night at our Hat Party on The Cozy Chicks Group. Why shouldn’t you come to the party too? So: Welcome everyone. Pull up a chair and have a cuppa. The theme was what hat would you wear to a tea party? We encouraged people to post pix of themselves in hats. We (Victoria and Mary Jane) LOVE hats and any opportunity to camp it up in them. What better excuse than our forthcoming Tea With The Cozy Chicks, a book all us are very proud of. We’ve each contributed a combination of special tea menus, tidbits, memories, facts, wardrobe suggestions, dream tea rooms and so much more. We weren’t sure if anyone would show up, but show up they did, including some of you. It was a very busy spot with some great hats and commentary. Here are a few! 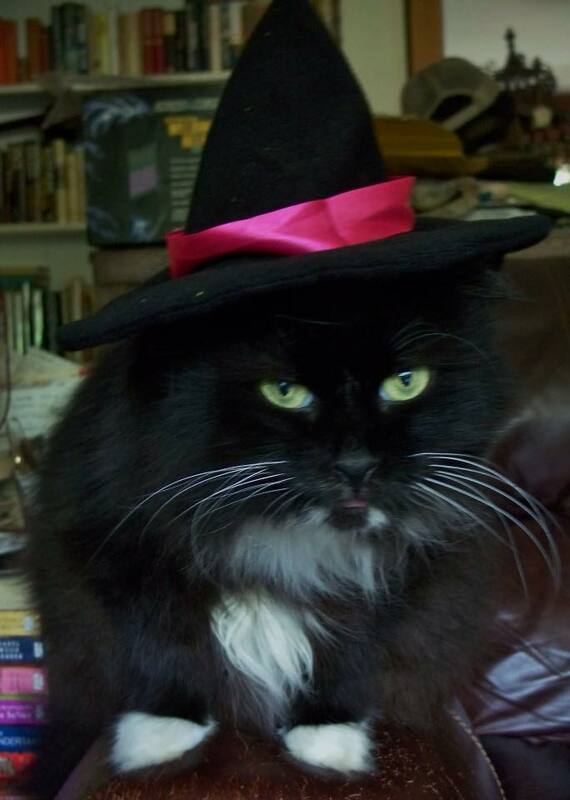 We were thrilled to be joined, not only by ladies in hats and ladies in hats they wished they owned, but also cats in hats, dogs in hats, and ladies without hats. Here's Ransom Oldsmobile's darling little 'Warlock'. Did I dream there was a rabbit? Or was that just a reference to Leann’s Mad Hatter’s Tea Party in Tea Time? Here's Leann's suggestion! Our Ellery wondered what hat people might want to wear to a tea at Storiton Hall. Here’s one of her great ideas! 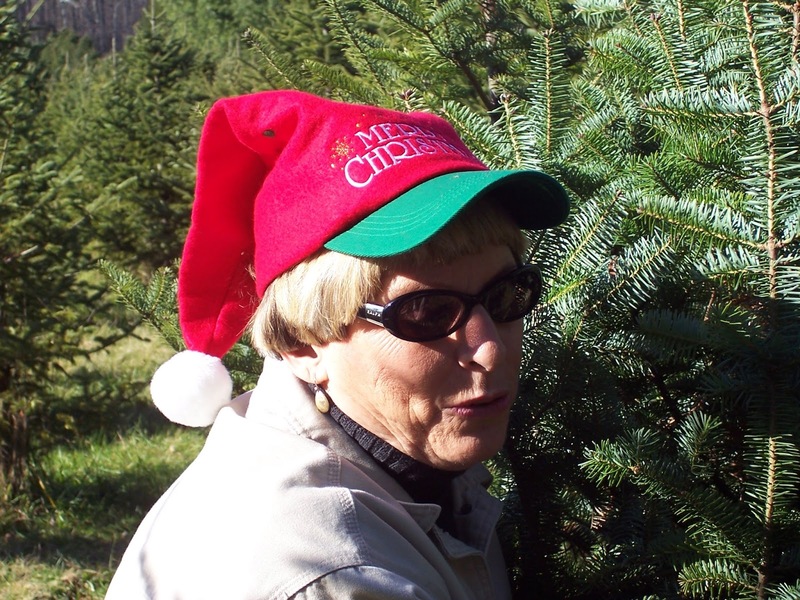 Duffy Brown looked very elfin in her Christmas hat. A Santa Tea perhaps? She’s bringing the tea. You can always count on Duffy to bring fun and energy. 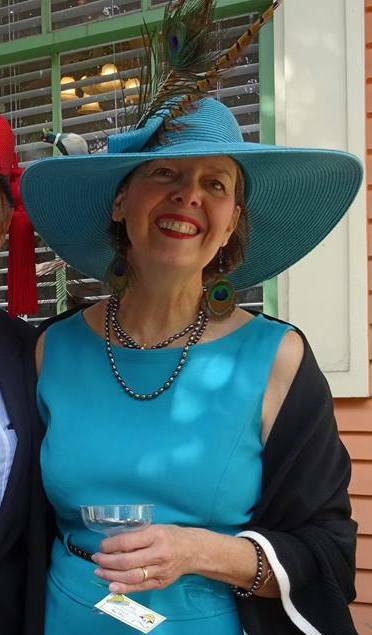 posted a shot of herself in New Orleans at the St Catherine’s (patron saint of milliners) party. That woul have been a blast! The whole thing was tons of fun. 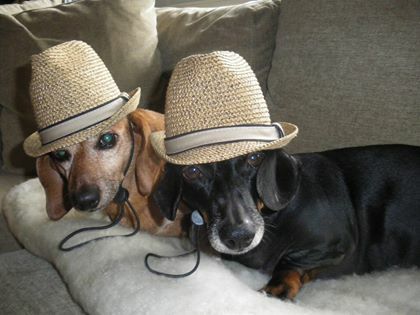 Daisy and Lily tried to sneak in with their gents’ straw Trilbies. They were stylin’ though! 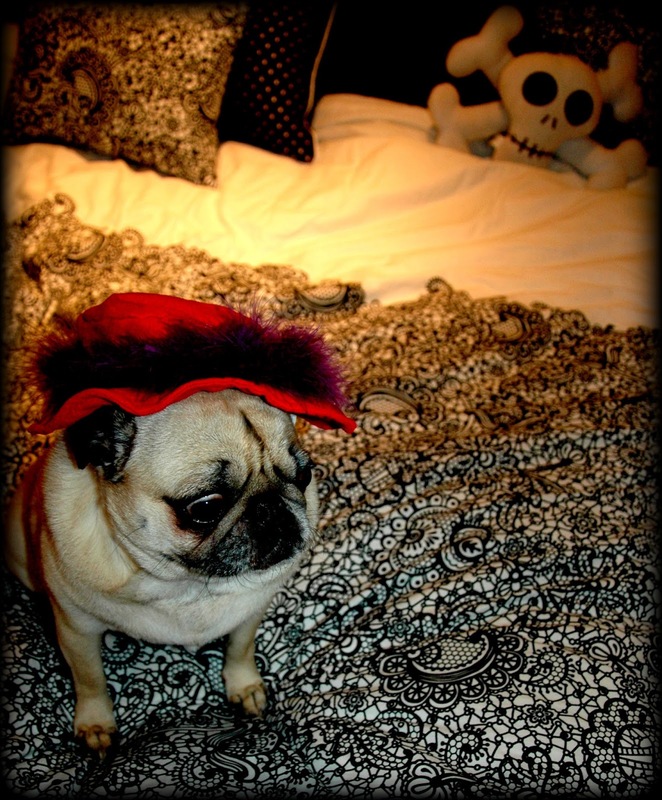 Peachy the Pug is always dressed for an event. Victoria and I had a great time and I even had a chance to sneak in a photo of my mum (and Victoria’s grandmother) who set the tone for hats and teas always. One of the things I loved doing for the book was writing a memory of the afternoon teas my mother used to host back in the dim mists of time. The tea book has been good for us too. At a mother daughter tea in the dim mists of time! We all wore hat then. The Kindle is available for pre-order now and the print version PREORDER link will be announced VERY soon with much fanfare (you know how excited we are!) I know you will all love it! Now, how about you? Do you have a hat to wear to the party? Tell us about it! Leave a comment and your email addy and you may win this wonderful teapot! No reason you couldn't have a snow tea party, using some of our recipes and menus. Details to be determined as they say. Wink wink! All I have is a big straw gardening hat. Do you think that would do? Well, you are welcome to our tea party! We'd love to see your hats too. Hugs! We think that would be great, especially as some of our teas are outside. But even inside a big hat rocks! Hugs. Thanks, Debbie! Year round sounds great to us Canadian gals, Debbie! Thanks for coming by. We hope you'll use Tea Time With The Cozy Chicks all year too. I really do not wear hats except in the winter. I do drink tea everyday. Looking for to Tea Time With The Cozy Chicks. I wear hats in the winter and not sock hats but stylish ones. I love tea, that is my drink of choice. I would love to win that teapot. 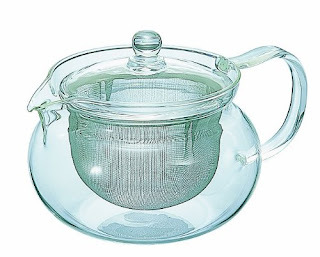 I have a great niece that collects teapots and that would be wonderful to add to her collection. She has been collecting them for several years and she is only 15 yrs old. All my hats are functional - the sock hat for the cold, the floppy flowery hat for my walks, and everything has a hood. Not too fashionable, I guess. 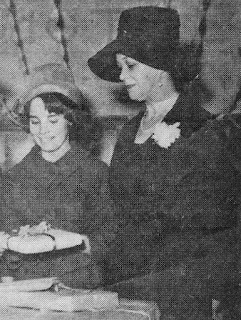 Some dear old church friends hosted a hat tea party many years ago. They were cousins and had quite the collection which they shared with us. All these pictures have reminded me of that party and those terrific (feisty) women. Thanks, Lois! Winter tea it is! We know you'll love Tea Time! Hugs. We are tea lovers too, Shirley! How neat that your niece has a tea pot collection. She'll probably love the Tea Time book too. That sounds like an amazing party, Sally! We had a great time with our Facebook party, but the real deal would have been great. Hugs! I've never been to a tea party, but have sipped a lot of tea. My grandmother used to keep a big pot going all day, adding bags and hot water. I never saw her take the old bags out. Maybe she did when I wasn't looking. The Facebook tea party was fun! It was great fun, MJ and you and your daughter were hostesses with the mostest! They all sounds great! I'd love to see the mad hatter one! Sounds wonderful, Christina! 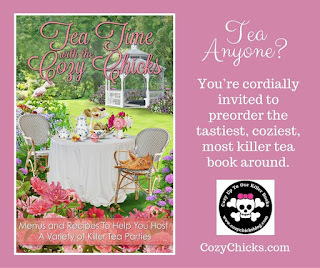 There are a lot of great menus and recipe in Tea Time With The Cozy Chicks. I am planning a couple of teas myself now. I agree. Karen's hat looks amazing. That hat sounds very dramatic! I think a cowboy tea would be fun too. You gals look great! Thanks for posting those hats on my FB page. We think you add a lot to the party! Tea parties in the backyard are wonderful. Floral hats make it perfect. Thanks for your kind words. I've never been to a tea party---but it sounds like fun. I haven't had a hat since I was a teenager----I had a pill box hat I just loved. I love the story about your grandmother, Nancy. That tea must have been quite bracing! It was fun having you at the tea party! Thanks, Leann. Sometimes we feel like the girliest with the silliest! We were so happy you could spend so much time with the guests at the party. A pill box hat! They were fabulous. Sue. MJ remembers them too. Very Jackie Kennedy. Even if you haven't been to a tea party, you'd be a pro with the tips in Tea Time With The Cozy Chicks. Thanks for coming by, Sue. Thanks, Janet. Of course, you know about tea time. I missed a photo of that hat, but I can just imagine it. I love that! A heavy hat at the tea party! And we don't always have to be fancy schmancy! I hope you are enjoying life. This is delightful fun. 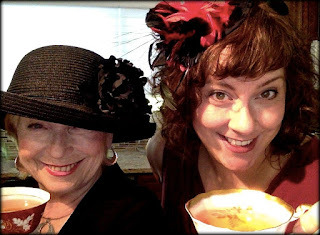 I love tea parties and the hats are wonderful! Cheers! I used to be in a Red Hat Society Group so I have several lovely hats. I also have a bunch of hats I that I often wear to church. I just love hats. 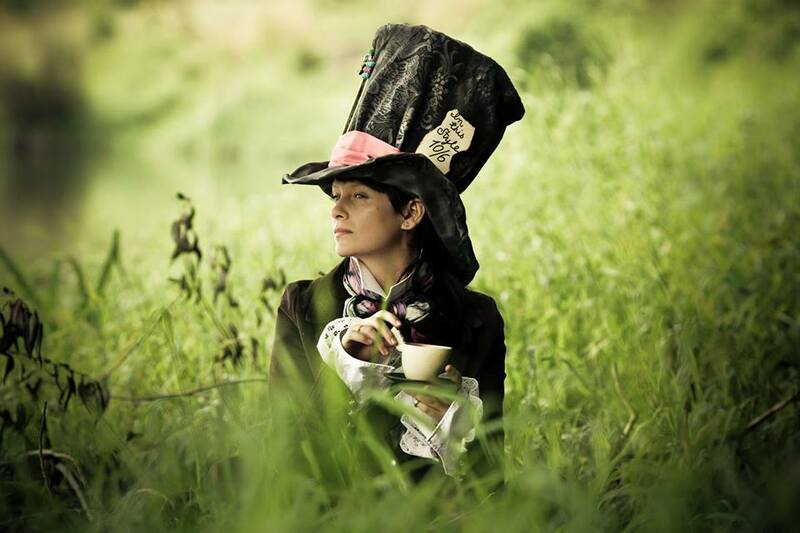 I have never been to a proper tea party but always thought it would be fun. I hope some one who can really appreciate and the teapot.